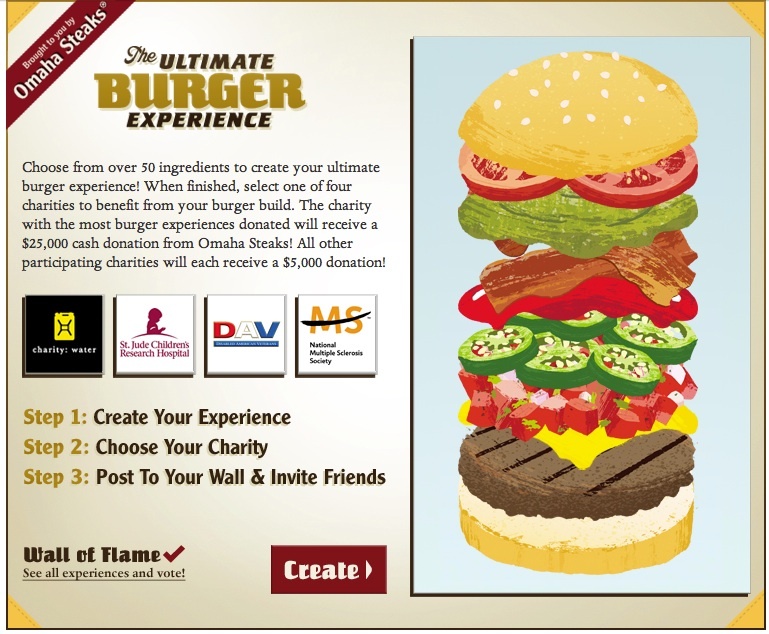 Omaha Steaks is inviting consumers to craft a virtual burger for a good cause via a new cause marketing campaign on Facebook. Each burger created becomes a vote for one of 4 charities: charity: water, Disabled American Veterans, National Multiple Sclerosis Society and St. Jude Children's Research Hospital. The company will donate a minimum of $5,000 to each of the four charitable organizations and the organization receiving the most virtual burger votes will receive a $25,000 donation. If the number of Omaha Steaks Facebook fans reaches 225,000 before the end of the promotion on February 29th, a $25,000 donation will be given to all four participating charities. At first look, this is a simple mash-up of a Facebook action-for-donation and a voting campaign featuring the company's product (to cast a vote, you make a burger). Of note, however, is the fact that if the page reaches a certain number of likes, all charities receive a $25,000 donation versus the minimum $5,000 donation. We predict we'll see more of these 'everyone can win' Facebook campaigns in 2012. What do you think? Share in the comments below.